We are delighted to announce the winners of our 50-year anniversary competition. The draw was held on Friday 27th April 2018 at 4pm and there was a total of 850 entries. The winners were selected randomly using a computerised random selection tool. 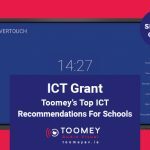 The select button was pressed by Mr Liam Sheehan Managing Director of Avio Distribution, the Irish distributor of CLEVERTOUCH Interactive Flatscreens. 1st Prize: CLEVERTOUCH V series 65” Interactive Flatscreen System w/ Realcast Dongle and professional AV installation. 2nd Prize: Realcast Dongle (allows you cast your IOS, android or Windows device to your HDMI display without cables). Who would believe that out of 850 entries, one school would win 1st and 2nd prize. 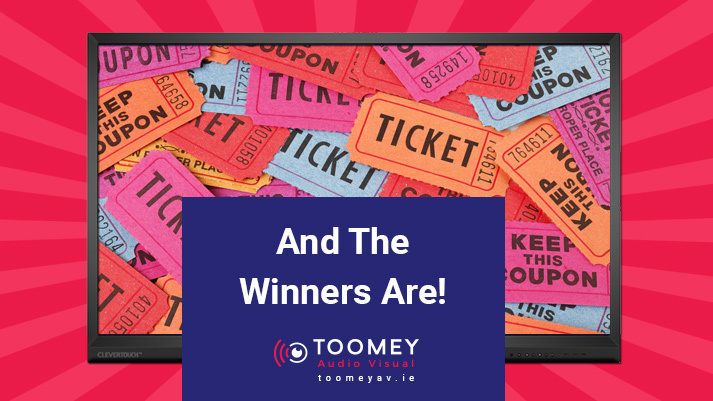 That’s the way it goes with the luck of the draw and so congrats to Trinity Comprehensive School in Ballymun for winning two prizes. And thanks to each of the 850 entrants for entering the competition, a great way to celebrate our 50th anniversary and we hope the prize winners will enjoy the new upgrades to the classroom ICT! 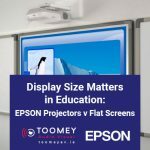 Toomey Audio Visual would like to acknowledge all our loyal customers over the years and extend our warmest gratitude for 50 years of continued business and support. Here’s to the next 50! !